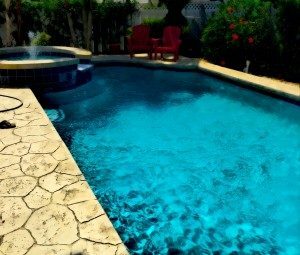 Pool Cleaning Fort Myers: Get Rid of Yellow Algae! Mustard algae, yellow algae, that yellow stuff in the corner of my pool. No matter what you call it, it’s ugly and something you don’t want on display in your pool. So how did it get there and how do you fix it? 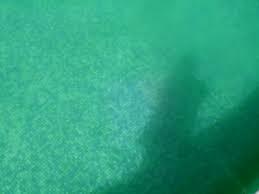 Well, all algae may not be created equal but, in general, algae are living organism that utilizes photosynthesis to grow, that’s why we see it so prevalently on sunny days in shady areas of our pool. It takes in Carbon dioxide and releases oxygen as a bi-product. Yellow Algae – This is a wall-clinging form of algae that makes a thin sheet layer on the walls and crevices of the pool. And it looks… well, yellow. With there being over 20,000 different types of algae, it is just easiest to refer to algae based on the color it gives off. 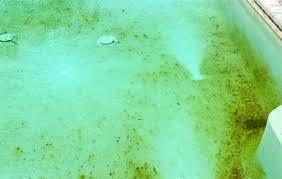 Yellow algae, once established in your pool can be very difficult to fight off and even harder to get it to stay out. If you can not get it cleaned completely, give us a call. We are pool cleaning experts. Did you know yellow algae can still grow with high chlorine present? AND MUCH MORE. So don’t be too hard on yourself if you have let some yellow algae get into the pool. Now let’s talk about how to get rid of it! I wish there was a secret formula, I really really do. Or at least a fairy Godmother that could show up to turn the pool crystal clear and turn a pumpkin into a carriage for me. But unfortunately she is busy so we have to make due with what we have. So here are the steps to get a pool clean and Algae free. Skim debris— Debris in your pool can contribute to the algae problem. Plus it’s gonna look much better without dead frogs at the bottom. Check circulation– Here is a big factor people overlook. Optimize flow in the pool the best you can. Change your valve control to have best circulation in the pool. Algae loves stagnant water. Balance chemicals — pH, chlorine, stabilizer, TA, and phosphates all play a role here. Make sure that everything is properly balanced as it should be. Add additional Algaecide — There are many algaecides out there, that range in all prices, everyone has their favorite. A good product is Yellow Clear. But see what your local pool guy recommends. For the most part, they are all pretty good and will help aid in your battle against algae. Clean Filter– Clean your filter Regularly, meaning once a day when you are fighting algae. A filter gets dirty, that’s what they are meant for. They will collect the algae, then they must be cleaned. If your filter is more than a year old, get a new one. This will make a world of difference. Let the pump run 24 hours a day — Circulation and filtration. Let the system run non-stop. Repeat — I know you know what this means. 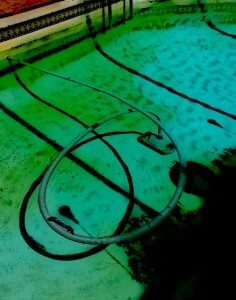 Vacuum– Often dead algae will fall to the bottom of the pool and look like sand and need to be vacuumed out. Well, it was short and sweet, all algae problems are unique. If you have a specific question don’t hesitate to send us an email at, Grandslamllc@gmail.com.